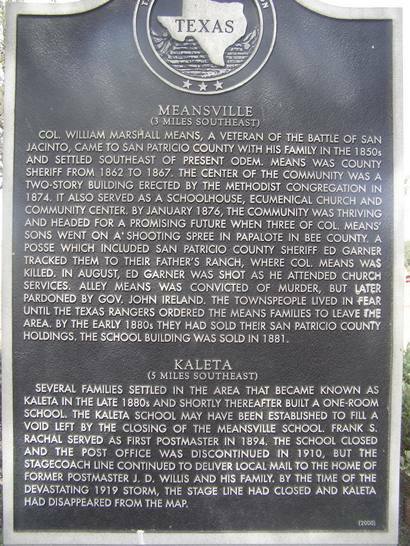 The Rise and Fall of Meansville Texas. Texas | Columns | "Charley Eckhardt's Texas"
You have to hunt for Meansville, Texas, and unless you have a guide who knows San Patricio County well, you won't find it. The cemetery is all that's left. The San Pat Historical Commission cleans it every now and then, so they're probably your best bet for finding a guide. Editor's note: Since no photos of the Means Brothers are available, the Wegenhoft Brothers of Colorado County (c. 1920) are standing in. William Marshall Means established Meansville in the late 1850s. He came to Texas as a boy, brought by his widowed mother. They homesteaded on the Pedernales, but apparently shortly moved eastward, probably because of Indians. On 21 April 1836 William Means was in Sam Houston's army at San Jacinto. He was detailed as a baggage guard because of his youth, and thus didn't take an active part in the battle. Nevertheless he was considered a soldier, and in lieu of wages - Texas didn't have any money - he got land warrants for a section and a half (960 acres, 1� sq. mi. ), which he took up in Sabine County. William M. Means was the first sheriff of Sabine County under the Republic. For reasons unknown he migrated west, and by 1860 he and his son Pole - Napoleon Bonaparte Means - were established in San Patricio County. They started the town of Meansville, and in 1862 'Colonel' Means (the title was apparently honorary) was elected sheriff of San Pat County. He served until martial law was established by occupying troops in 1867. 'Colonel' Means had six sons. The older three, F. B., N. B., and W. B., were all apparently honest, hard-working citizens. All were ranchers in San Pat County. W. B. Means once served as his father's deputy. The three younger boys, John H., Hugh, and Alley, were 19th Century juvenile delinquents. The elder Means fell afoul of the law in San Pat County in 1875. To combat Texas fever, also known as Mexican fever and redwater fever, since an infected cow's urine was red, South Texas cattle, which carried the disease but were immune to it, were required by law to be dipped to kill the fever ticks. Dipping did no good unless everybody dipped his cattle, and William Means refused to dip his cattle. The San Pat sheriff, Ed Garner, together with several ranchers, rounded up the Means cattle, drove them to the vats, dipped them, and drove them home. William Means was sent a bill for the dipping, but he never paid it. The three youngest Means boys are scattered all through court records in San Pat, Bee, and Nueces counties. Their offenses were minor but annoying-and often downright dangerous. On 30 January 1876 all three rode to Papalote, in Bee County, for a dance. Apparently they hit every saloon in Papalote, because by late afternoon they felt neither pain nor remorse. They rode their horses into a general store and began to shoot the place up. If it would break, spill, or make a mess they shot at it, including shooting several holes in a barrel of blackstrap molasses. Somewhere in there a sense that they'd gone a mite far penetrated the alcohol fog, because right after shooting up the store they pulled freight for San Pat County and home. We know they got to their father's place, but we don't know what he was told about the happenings in Bee County. 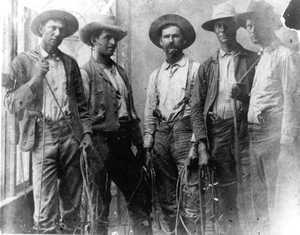 Sheriff W. K. Clark of Bee County raised a posse and started after them. He also sent word to Ed Garner in San Pat. It was pretty late when the two sheriffs and their posses reached the Means place. When they called for Colonel Means to send the three out to be arrested on charges of willful destruction of private property and disturbing the public peace of Papalote, Bee County, Texas, the old man came out in his nightshirt. He was also packing a rifle. What was said and by whom isn't known to this day. We also don't know who popped the first cap. We do know that William Marshall Means stopped a load of blue whistlers and was dead when he hit the porch boards. The three younger Means boys, apparently seeing that the law meant business, surrendered without a fight. Alley, who was 18 and had no better sense, told Sheriff Garner "You killed my father. This isn't the end of it." The 'end of it' was a while in coming, and it didn't really end then. Seven months and 27 days later, August 26, 1876, was a Sunday. The Garner family went to evening services at the Methodist Church in Meansville. Ed Garner, as was his custom, took off his gunbelt and put it in the crotch of a tree so he wouldn't be entering the church with a sixshooter on his hip. About the time the sermon ended Alley Means was seen to ride up to the church, dismount, and tie a horse. Ed Garner turned to his brother Marion and said "Alley Means is out there and I believe he's going to shoot me right here in church." He was right. He got up and walked to the door, probably intending to bluff Alley down. Alley tied the horse, and there was someone out there with a rifle, but most of San Pat County doubted it was Alley. The someone fired two shots, one hitting a pew just inside the door and the other taking Ed Garner through the heart. It was fairly dark. While folks could tell somebody got on the horse Alley tied and rode away, it was too dark to be certain who the shooter was. According to oral history in San Pat County, the following morning Eliza Means, William's daughter, went to the church and danced a jig on the blood spot left where Ed Garner fell. Nobody believed it was Alley Means who actually fired the shots, but he was tried and convicted of the murder. He was the one who made the veiled threat the night his father was shot. He was seen riding up to the church and tying the horse the killer escaped on. He was greeted by several people outside the church but didn't come in. He was seen peering in the church windows during the service. All the circumstantial evidence pointed to Alley, if not as the actual shooter, certainly as an accomplice. Most folks in San Pat County believed that, although John actually fired the shots, the family decided Alley should take the fall because of his youth. That might, say those who still talk about it, get Alley off light. Alley Means was arrested and made bond. On 7 November 1879, he married Sallie Campbell in DeWitt County. By the time he was finally tried and convicted, he and Sallie had a year-old son. He was convicted of willful murder of a law enforcement officer, Sheriff Ed Garner of San Patricio County, in district court in Nueces County. He was sentenced to life in prison. While he was in prison John cared for Sallie and the boy. Alley entered the Texas State Penitentiary at Huntsville on 6 March 1881. On 9 May 1885 he walked out a free man, having served four years, three months, and three days. According to the Means family, they paid $500 for a gubernatorial pardon-"as was customary at the time." Whether that's true or not, it is recorded that early in 1879 the Meanses, all their worldly goods loaded in a 23-wagon train, rolled out of Meansville headed west. It was accompanied well beyond the San Pat County line by a number of people, several of them Texas rangers. The Means family never returned to San Pat County, and the only Means remaining is the old Colonel, buried in a cemetery that's all that's left of what he once hoped would be a thriving town bearing his name. Not even a lonesome ruin marks that hope today. All that's left are tombstones, and most of them are so weathered it's hard to read the inscriptions.